Few objects of utter evil have inspired human imagination more than the ominous gas ovens of Auschwitz. Auschwitz is the epicenter of the Holocaust, the baseline of absolute evil. Here is where millions are said to have been murdered and obliterated in the gas ovens by the Nazis. But that’s where the problem begins, because there was no such things as a “gas oven.” What did exist, though, were cremation furnaces used to turn into ashes the remains of deceased inmates. Survivors claim that thousands of corpses were burned in them every day, and that smoke and flames shot out of the crematory chimneys. The present study investigates the Auschwitz cremation furnaces from the bottom up. In the first section, the authors summarize the principles of combustion technology and briefly explain the chemical and physical processes of corpse cremations. Next they sketch out the development of modern cremation techniques with emphasis on Germany, and they investigate the results of several scientific cremation experiments conducted over the past 100+ years. Based on this data and on numerous scientific publications on cremations, they establish important benchmark figures, such as how long it took to cremate a corpse, and how much fuel was needed. 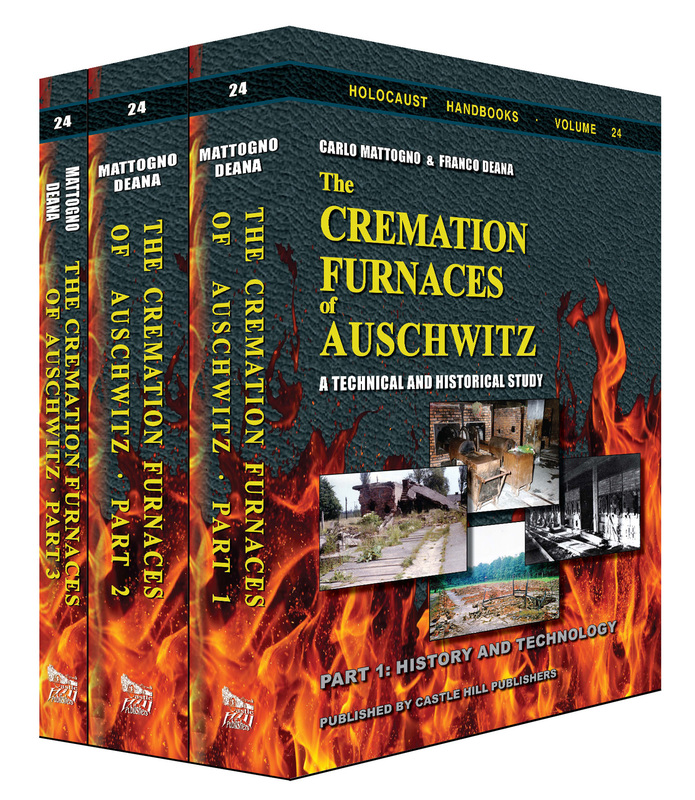 The second section analyzes in depth the activities of the German company Topf & Sons, who manufactured the cremation furnaces at Auschwitz and other Nazi camps. Mattogno and Deana next describe in detail the history and properties of the different types of furnaces installed. The authors then calculate cremation durations and fuel consumptions for each of the furnaces based on scientific experiments, documented data from actual cremations in similar furnaces, and mathematical calculations. They show that witness statements about gargantuan cremation capacities are wildly exaggerated, and they also prove that it was physically impossible for any flames to come out of the Auschwitz crematory chimneys. 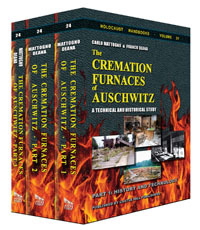 This book ends with an overview of the cremation furnaces installed at other German concentration camps by other companies, and it briefly explains the legal framework within which cremations were conducted in WWII-era Germany both outside and inside its camp system. Set of three parts: Part 1, History and Technology: 480 pages; Part 2, Documents: 476 pages; Part 3, Color Photographs: 242 pages (1198 pages total). Set of 3 tomes with a total of 1198 pages. Format: pb, 6"×9", 891 illustrations, bibliography, index, glossary. Published by Castle Hill Publishers (Uckfield, UK) in July 2015.